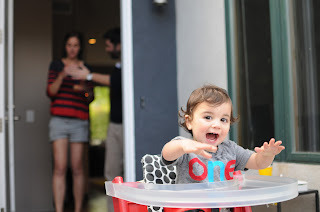 Nautical by Nature: Baby Nautical's Circus First Birthday Party! So cute! Baby Nautical is adorable and looks a lot like his aunt! Oh my gosh so cute! What a fun party idea! He is an absolute cutie and looks like so much fun! What a sweet party. Thank you for having a circus-themed birthday without any creepy clowns, too! I love all of it! The pictures hanging from tree are my fave pRt- so sweet and sentimental. Baby Nautical is adorable!! Beautiful pictures!!! OMG, he is so cute! I love the party decorations and especially that play area! What a great party! Gorgeous celebration! The little milk containers make me smile as well as the rest of the party! I thought that was a fun little detail! Cute party for the cutest baby! Just wondering where you found your awesome cupcake holder? Just wondering where you found your awesome cupcake stand? It is from Oriental Trading.